Ford Friday. 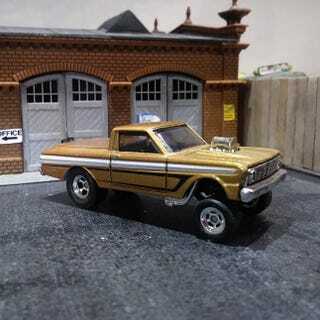 Ranchero Gasser edition. When i saw this paint scheme on the HW Ranchero i knew it needed to be a gasser. Having finally replenished my stock of drag slicks, i was able to finally build it. The only bodywork done was opening up the rear wheelwells. Then i fitted a different engine, added fenderwell headers, slipped a leaf spring straight axle under the front and the aforementioned slickes out back. Finally, it needed some detail painting.